The Quantum Liquid Fund has invested only in Government Securities, Treasury Bills and Commercial Paper/ Certificate of Deposits issued by AAA rated PSU entities. (Public Sector Undertakings). 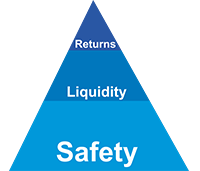 Quantum Liquid Fund also follows an industry leading practice of completely marking to market (MTM) its entire liquid fund portfolio in keeping with SEBI's mandate of fair valuation of secrurities. This ensures that the NAV of the fund is more closely linked to the actual realizable market value of the assets.